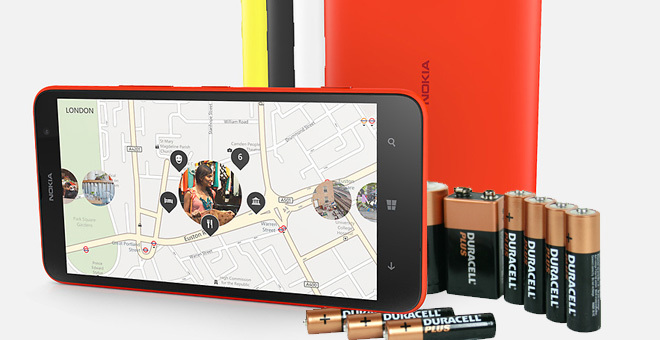 With our review of the Lumia 1320 under way, we managed to run the smartphone through our battery life test gauntlet and we are now giving you the scores. With an endurance rating of 105 hours, its premium brother the Lumia 1520, set the bar pretty high leaving no room for mediocre performance on Lumia 1320′s side. And at least on paper we shouldn’t expect the Lumia 1320 to flop. It sports an identical battery to the Lumia 1520 – a 3,400 Li-Ion unit as well as the same 6″ display, which is even of lower resolution this time. Inside the Nokia Lumia 1320 lies a pretty dated Qualcomm Snapdragon S4 chipest with a 1.7GHz dual-core Krait CPU and an Adreno 305 GPU. It lacks the clever battery management optimizations of the more potent Snapdragon 800, so it’s going to be interesting to see just how much this reflects on the battery life. Let’s get the ball rolling, shall we? First off, we start with the 3G talk time test. 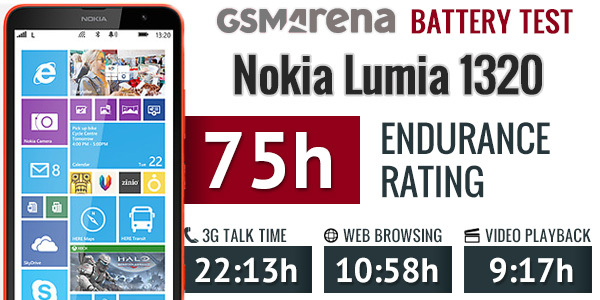 The Nokia Lumia 1320 got the same time as the Lumia 1020 – 22 hours and 13 minutes. That’s more than 6 hours behind the Lumia 1520 and keeping in mind that the screen is turned off when speaking, you can clearly see the drawbacks of the old radio and chipset architectures. Nevertheless, outside its own camp, the 1320 does alright. The Samsung Galaxy Mega 6.3, which is one of the main competitors of Nokia’s mid-range phablet scores 19 hours 54 minutes. The Huawei Ascend Mate and Alcatel One Touch Hero manage to beat its achievement, though. Onto web browsing, where the 6″ IPS LCD ClearBlack HD display kicks in to shuffle through webpages. The Lumia 1320 managed just 2 minutes short of 11 hours, which is not too shabby. It’s ahead compared to nearly all of the Android competition safe for the HTC One Max, which is the only Android phablet that managed to stay on longer. Strangely however, the phablet is also nearly an hour behind the Lumia 1520 – it appears it’s lesser chipset is working a bit longer than the Snapdragon 800 here and ends up consuming more power. Finally, it’s time to see how the Nokia Lumia 1320 fared in the video playback test. It managed to hold up 9 hours and 17 minutes of straight video playback, which beats the Samsung Galaxy Mega 6.3′s time of 8 hours and 34 minutes, but is otherwise quite uninspiring given the battery capacity. There’s clearly some room for optimization here as the Lumia 1320 should be able to at least match the score of its Lumia 1520 sibling. The stand-by performance of the Lumia 1320 was good, but due to its less inspiring performance in the individual tasks the mid-range phablet couldn’t beat the record of its high-end sibling. It still managed a great endurance rating of 75 hours meaning you should get just over three days of usage before you have to charge your device if you do an hour each of talking, browsing, and watching videos per day. Keep in mind that our tests were done with Glance screen turned on, so if you switch it off you might be able to improve stand-by efficiency and even go longer.